Limited Edition 3 3/4-inch scale Santa Claus Action Figure! Retro-styled action figure derived from The Twilight Zone. Based on the episode "The Night of the Meek." Every year, Henry Corwin takes a job as the department store Santa. But this year will be a little different, as Henry will soon find himself part of the magic and wonder that is Christmas! 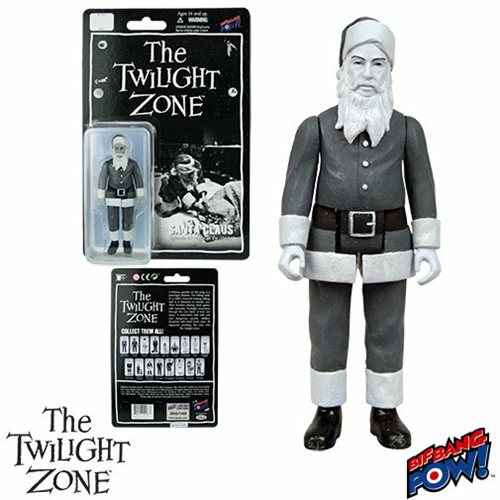 This limited edition from Bif Bang Pow!, features a detailed color figure of Santa Claus from Season 2, Episode 11 “The Night of the Meek” of The Twilight Zone. Individually carded and numbered, the figure measures approximately 3 3/4-inches tall and is made from plastic. Based on the retro design of action figures from the 70s, it features five points of articulation: neck, shoulders, and hips. Order yours today! Ages 14 and up.